Self-transcribing active regulatory region sequencing (STARR-seq) is a massively parallel reporter assay to identify transcriptional enhancers directly based on their activity in entire genomes and to assess their activity quantitatively (Arnold 2013). 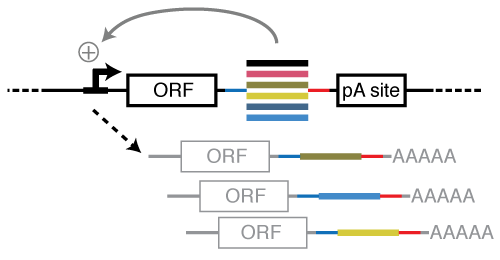 Enhancer activity is directly linked to the underlying DNA sequence and measured as presence of the resulting reporter transcripts among cellular RNA by deep sequencing. STARR-seq is complementary to STAP-seq: while STAP-seq measures core-promoter activity using a single defined enhancer, STARR-seq measures enhancer activity using a single defined core-promoter. Now in Nature Methods: Resolving systematic errors in widely-used enhancer activity assays in human cells enables genome-wide functional enhancer characterization. Content from Muerdter et al., Genomics 2015.